Sounds like a fascinating show. If you’re in the area check this out! Kara Walker’s “A Subtlety or the Marvelous Sugar Baby…” has become one of the most talked-about art exhibits in New York City this spring. 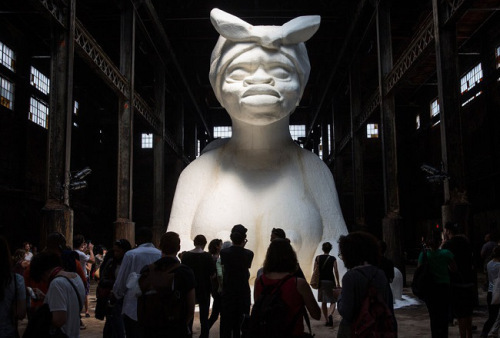 The show’s lengthy full title, “A Subtlety or the Marvelous Sugar Baby: An Homage to the unpaid and overworked Artisans who have refined our Sweet tastes from the cane fields to the Kitchens of the New World on the Occasion of the demolition of the Domino Sugar Refining Plant,” is a look at the Caribbean slave trade and sugar boom, with a white sphinx made of sugar housed inside the abandoned Domino Sugar Factory in Williamsburg, Brooklyn at it’s centerpiece.